My name is Atsushi Nashimoto from Japan. I am very happy to be a member of the spring 2009 team with you all. I come from Ibaraki prefecture, two hours away from Tokyo. Studying in the international communication at college as well as postgraduate school at Tokyo, I joined in Up with People as a road staff and traveled around the world. Then, as a member of the Japan Overseas Corporation Volunteers, a Japanese version of Peace Corps, I worked in Papua New Guinea where people call “the land of unexpected” for two years as a community development officer. I have just returned from PNG in this January and am going to jump into the spring 2009 team. I am very excited to see you all next month. If you are interested in my life in Papua New Guinea, please visit the following website. 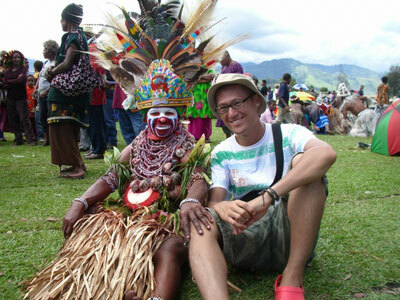 You may download monthly PNG news letter both in Japanese and English with amazing pictures. Just go to the bottom of the webpage and you will find icons “PNG NEWS”. Please enjoy reading! Previous PostThank you for Meeting the WCI Team at the Denver Gap FairNext PostOpenings still Available for the Nagasaki / Kumamoto Area Spring ’09 Program!